Israel's military court system, a centerpiece of Israel's apparatus of control in the West Bank and Gaza since 1967, has prosecuted hundreds of thousands of Palestinians. This authoritative book provides a rare look at an institution that lies both figuratively and literally at the center of the Israeli-Palestinian conflict. 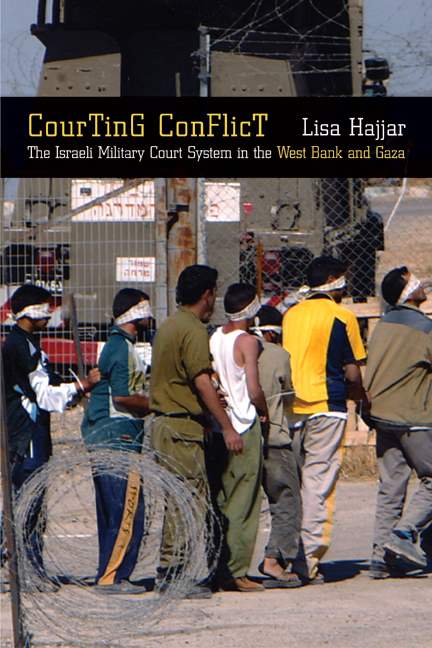 Lisa Hajjar has conducted in-depth interviews with dozens of Israelis and Palestinians—including judges, prosecutors, defense lawyers, defendants, and translators—about their experiences and practices to explain how this system functions, and how its functioning has affected the conflict. Her lucid, richly detailed, and theoretically sophisticated study highlights the array of problems and debates that characterize Israel's military courts as it asks how the law is deployed to protect and further the interests of the Israeli state and how it has been used to articulate and defend the rights of Palestinians living under occupation. Lisa Hajjar is Associate Professor in the Law and Society Program at the University of California, Santa Barbara.